Hello and welcome back to the Thistle & That blog! In our last blog post, we talked about how to DIY your wedding on budget and one way you can do that is by opting for DIY wedding flowers. It can be expensive to hire a florist to create the wedding flowers of your dreams and can quickly put you over budget. When you work with Thistle & That, you not only have access to our beautiful wholesale fresh flowers, but also classes by David Kimmel himself! Kimmel is sought after by brides all over the Dallas area and beyond for his floral arrangements that are works of art and for his easy-going nature that makes him an absolute dream to work with. Learn from Kimmel and create stunning bouquets and floral arrangements using DIY wedding flowers. 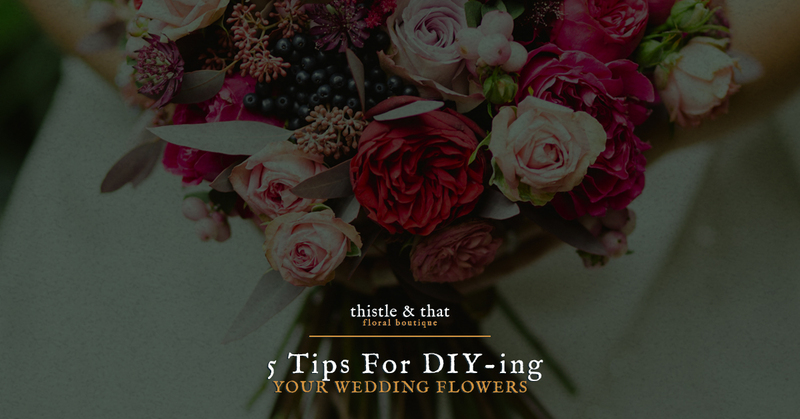 Visit our website to learn more about Thistle & That and keep reading to learn more about DIY wedding flowers. Whether you DIY your wedding flowers or not, you must do your research and decide what kind of flowers and look you want for your wedding. Pinterest is an excellent resource for seeing all the possibilities for your wedding and ways that you can truly make your wedding your own. Also, if you already have a venue booked, look at pictures of weddings that they have hosted and see what kinds of floral arrangements look best with the aesthetic of that particular venue. As you research and decide what kind of wedding flowers you want, remember to keep it simple. Extravagant arrangements can be beautiful, but often simpler is just as beautiful and perhaps even more elegant. Whatever you decide, remember that you will be assembling your bouquets and arrangements on or near your wedding day and so you will most likely not have a lot of time and attention to lend to your wedding flowers. Choose flowers and a look that you know that you can create with the time and help that you have. Speaking of help! You don’t have to and shouldn’t have to assemble everything by yourself. Instead of trying to do everything yourself, enlist the help of your friends and family. By having them assist you, you can not only alleviate more stress, but you can also enjoy time with those who you love. Those who love you and are excited about your special day will enjoy being a part of your day and together you all can create memories that you will cherish for years to come. Buying flowers in bulk will also save you a lot of money in the long run. Wholesale fresh flowers are less expensive than enlisting a local florist and allow you to get beautiful blooms for your wedding at a fraction of the cost of buying flowers from anywhere else. Buying flowers in bulk also gives you the option to have creative control over your bouquet and your floral arrangements. Take A Thistle & That Class! DIY wedding flowers can seem like a huge task to undertake but with the help of the Thistle & That staff and David Kimmel himself, you can create stunning floral arrangements that will help you create the dream wedding that you have always wanted. When you buy your flowers in bulk from us, you get access to the DIY wedding flower video that will help you create your floral arrangements easily. We offer candles, fabrics, and other materials as well. Visit our website today!